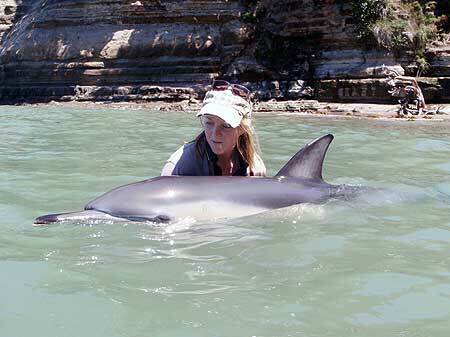 Department of Conservation worker Stephanie Watts with the injured dolphin before it died. 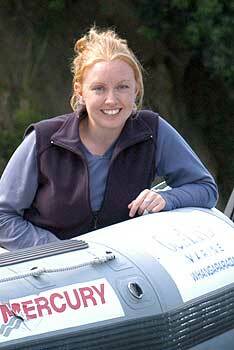 Marine biologist Dr Karen Stockin has called on boat owners and jet ski operators to be vigilant around marine mammals following the death of a common dolphin from an injury likely to have been caused by a collision in the Hauraki Gulf. Dr Stockin, a lecturer at the University’s Institute of Natural Sciences at Albany, carried out a post-mortem yesterday after being called to Toroa Point, Torbay, on Sunday, where a 1.7m dolphin was seen floundering in the shallows. Locals at the beach reported the injured animal to the Department of Conservation. The dolphin was earlier seen swimming off the bay with other dolphins where small motorboats and jet skis were also operating. Dr Stockin, who has been researching the New Zealand common dolphin in the Hauraki Gulf for the past decade, says they forage and breed in the gulf and are generally able to avoid boats that follow a predictable course through the water. However, small speedboats and jet skis that change speed and direction erratically create a hazard for marine mammals, she says. Department spokesman Phil Brown says the Marine Mammal Protection Act requires boaties to keep a certain distance from marine mammals and that places the onus on the operators to be vigilant.